Born in New Jersey, raised in Chicago, Dr. Dennis finally made it to the great state of Texas as a teenager. She graduated from Keller High School where she played on the golf team and went on to attend college at the University of Texas Arlington graduating with a Bachelor of Science in Biology. She attended dental school at the University of Texas Health Science Center San Antonio where she fulfilled her dream of becoming a dentist and met her husband, Adam. 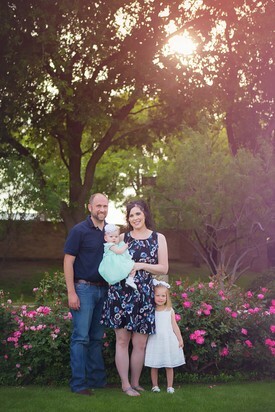 After practicing general dentistry for a few years in the Fort Worth area, she and her husband made Abilene their permanent home. Dr. Dennis has embraced the Abilene community and could not imagine living anywhere else. In Feburary of 2015, Dr. Dennis and her husband welcomed their first child, Dylan Kate and in October of 2017, welcomed their second daughter, Chase Abigail. Dr. Dennis' main goal is to provide comprehensive dental care to each and every one of her patients. She emphasizes education and prevention and embraces new technology to allow her patients to take an active role in their oral health. Professionally, Dr. Dennis is a member of the American Dental Association, Texas Dental Association, and the 17th District Dental Society.